On this World Day of Marriage, in today’s gospel (Mark 1:29-39) we observe Christ at the beginning of his ministry, entering not the Temple in Jerusalem or even a synagogue, but a house. This was the house of Peter, who would one day be the Bishop of Rome, but was the fisherman who with his brother Andrew abandoned his nets to follow Jesus, and who lived in the town of Capernaum on the Sea of Galilee with his wife, his mother-in-law and presumably with his sons, daughters and other family members. On this Sunday celebrating marriage throughout the universal Church, our gospel provides us the opportunity to meditate on the “domestic church”—married couples and the families which are the fruit of their love and fidelity. We know that Peter’s house, too, eventually became the site of an early Christian house church, and then predictably a shrine and a Byzantine basilica, which in past decades has been uncovered by archeologists. But it is Peter’s house as the home of a particular family that is what interests us today. In the gospel account we see how the entry of Jesus into the intimate setting of Peter’s home and household teaches us some important lessons about discipleship, healing, service and mission. “Jesus entered the house of Simon and Andrew with James and John.” In Peter’s household Jesus found welcome and friendship. His house was made of rough stones mortared together. There was no guest room, only a hearth for cooking meals and an open area for eating and sleeping. His living presence is the indispensable foundation of living out our call to holiness and mission as married couples and as parents. We should strive each day to put Jesus and his teachings, his example and his way of life at the very heart of our married life, so that our families might become more and more the “the household of Christ,” which was one of the earliest ways the Church described itself. “Simon’s mother-in-law was sick with a fever.” Within the household of Christ, every one of us is sick and in need of healing. Our affliction is that each of us, living in a fallen world is, wounded by our own sins and the sins of others. While we are in need of healing, we cannot heal ourselves. We are in urgent need of a Savior. 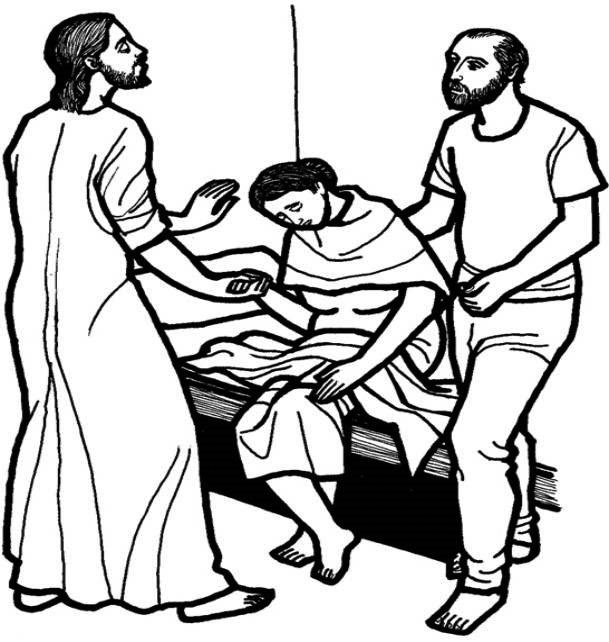 Mark tells us that “they,” that is to say all those in Peter’s household, together brought the illness of one of their members to the attention of Christ. Their actions reveal to us the vital importance of commending each other in our physical and spiritual affliction to Jesus, asking for his mercy and healing. Every day we have the grace-filled opportunity to intercede for our spouses and family members who are hurting, who are sick or infirm or who are struggling with any kind of difficulty or addiction. 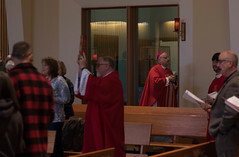 We must never think that healing in our marriages and in our family life is too unimportant to merit the attention of Jesus, who is the physician of our souls and bodies and who desires to heal us in the sacraments of Penance, the Eucharist and Matrimony. We can learn, too, from the eagerness of Jesus to heal Peter’s mother-in-law. Mark tells us that he “approached, grasped her hand, and helped her up.” What a compelling image of how the Lord reaches out to us with such compassion and love. What a beautiful image of the love of husbands and wives, taking each other’s hands and helping to raise them up. Having been healed by Jesus, Mark testifies that Peter’s mother-in-law then “waited on them.” Scripture scholars tell us that Mark uses the same word for her service that is used in the New Testament for diaconal service. They believe that it is not so much that Peter’s mother-in-law somehow jumped up to resume cooking and cleaning, rather, that she is intended to symbolize how every member of the Christian community, having been saved from the power of sin and death by baptism, must necessarily enter into the service of the brothers and sisters and of the poor and those in need. Does the healing and other good work that the Lord has done in our marriages, in our families, in the “household of Christ,” attract others? Does our joy and kindness, our hospitality and generosity, our compassion and service all in the name of Christ, bring the whole town (or at least the neighborhood) to our door? On this World Marriage Sunday, let us remember that all of the goods and blessings of marriage are truly Christian only to the extent to which our marriages are a lived participation in the joy, the grace, the peace and the hope of the Lord’s death and resurrection. He has pitched his tent in the midst of our life together to bless, heal and transform us, not for ourselves alone but for the sake of the Church’s mission to make disciples of all nations. May we as husbands and wives live out our call as servants and heralds of Jesus Christ. 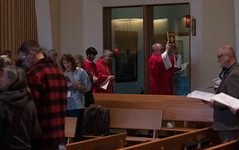 Deacon Charles Rohrbacher is the Office of Ministries Director for the Diocese of Juneau. Phone: 907-586-2227 ext. 23.